What do PACIFIC RIM’s towering, robotic warriors and my opinion about this, the latest film by Guillermo del Toro (PAN’S LABYRINTH, HELLBOY), have in common? Both are of two minds! But seriously, folks. 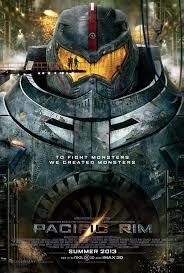 PACIFIC RIM is a joyful, kinetic, unmissable toboggan run through genre Babylon. But whether it’s smarter than it oughta or dumber than it coulda will depend on how lithe or lumbering you fancy your sci-fi. Del Toro’s first directorial effort since 2008’s HELLBOY II: THE GOLDEN ARMY, PACIFIC RIM is only occasionally brilliant, but relentlessly entertaining and visually epic, nonetheless, pitting 300-foot-tall amphibious monstrosities (Kaiju) against towering, human-piloted mechs (Jaeger) in stunning rock ‘em, sock ‘em death matches. In a cinematic climate dense with all-too-familiar genre origin stories, RIM won me over immediately by breezing through half a film’s worth of by-the-numbers exposition in a terse five-minute burst – the Kaiju attacked from an undersea portal called the breach, we built Jaegers (German for “hunter,” the film helpfully offers) to fight them, everything was working out awesome, but now – uh-oh – too many Kaiju! A typical problem with movies featuring large-scale action scenes performed by CG day players is the sheer disorder of calamitous combat and Ritalin-eligible editing - light and noise that inarguably signal destruction is happening, but without any traceable narrative course. PACIFIC RIM executes large-scale digital action marvelously. We feel the incomprehensible weight of every mech, the gruesome mass of every monster. Early battle scenes deftly establish the mechanics of Jaeger combat, and the ballistic arsenal each possesses. The Kaiju are beautifully designed and meticulously rendered atrocities - towering collisions of Toho and Lovecraft rendered in scales and chitin and neon ichor. When the two come together, each with signature moves and distinctive strategies, we can follow every punch. More akin to the brutal poetry of classic boxing than the chaotic violence of MMA fighting – to the lumbering, polymer-draped rumbles of so many thrillas with Godzilla than the noisome clatter of Deceptacons – it’s a steel-bending, bone-crunching ballet of gargantuans. It’s a good thing the battle scenes, which dominate the film, are bolstered by a thrilling sense of weight because much the character work is simply leaden. While del Toro and co-writer Travis Beacham (CLASH OF THE TITANS ) do enough to make characters distinct from each other (even if it means something as cartoonish as the brutalistic haircuts on two Russian bruisers, or as idiosyncratic as the Vaudevillian limp and out-sized stodginess that dog Herr Gottlieb), even the two leads don’t have much to offer besides ab-swaddled baditude and store-bought motivations. The imperiled future Earth that surrounds the heroes is a fascinating one, but also not without its issues. Post-Kaiju Hong Kong is a wonderland of fantasy set design. Steampunk smuggler king Hannibal Chau (HELLBOY’s Ron Perlman) presides over a bustling black-market Kaiju organ-smuggling business. A bundle of ornate bars and shops is stacked crowded into the empty spaces between the chalky monoliths of an abandoned Kaiju ribcage. Feeble municipal shelters pack herds of the frightened into crude cement bunkers. The little time we spend in the world outside Jaeger brawls and the Shatterdome is magical, with sets almost as gorgeous and detailed as HELLBOY II’s unmatchable troll market. It has me at odds: that we don’t get to spend a bit more time exploring the tumultuous civilian world is a marked disappointment; that we get to spend any time there at all is an indescribable delight. Likewise, high-flown science fiction concept “the drift” – the place where Jaeger pilots’ minds meet, forming a collective consciousness as they interface with the circuitry - is rife with possibilities. The film uses it to largely utilitarian purpose – it affords the filmmakers a readymade device through which to show and not tell, spicing up traditional flashback while simultaneously kicking the plot forward. It works fine (I can’t deny the giddy kick I felt when Geizler proposes an ingenious reappropriation of drift technology), but It also feels like a missed opportunity to develop the cardboard protagonists. Sure, we witness Mako’s most defining memory… but why not her darkest fantasy, her most improbable dream, her truest fear, or her pettiest resentments. It would have been compelling to witness co-pilots as they experienced and accepted the darkest, most private cloisters of each other’s psyches, rather than just the most convenient character beats.